The recently redesigned Toyota Camry boasts a roomy and refined interior with the smooth sedan ride you expect from Toyota's popular mid-size car. 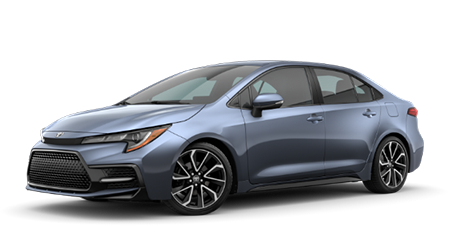 The affordable new Corolla is packed with Toyota tech, from its Toyota Safety Sense suite of driver-assist features to its range of available Entune Audio systems. Take to any adventure behind the wheel of the sporty and versatile new RAV4. This compact SUV is big on style and technology, so test drive one today! Treat the entire family to a stellar three-row crossover SUV that makes use of Toyota's latest safety technologies to help ensure a safe journey. Mark McLarty Toyota is honored to be the North Little Rock, Arkansas area's dedicated Toyota dealer, and we look forward to assisting our Conway, Arkansas neighbors with any vehicle trade-in, purchase, lease or service needs. Whether you are shopping for a brand-new Toyota or seeking maintenance for your current car, do not hesitate to give our new and used dealership a call at (501) 708-2044 to learn about the many automotive services we offer. Or, simply drop by our North Little Rock location for a hands-on shopping experience! 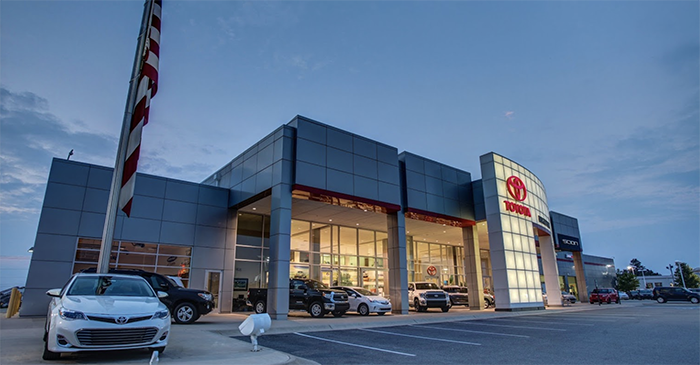 At our full-service Toyota dealership near Pine Bluff, AR, you'll find driver-friendly pricing and hassle-free shopping from beginning to end. Let our sales associates introduce you to new Toyota RAV4 models that complement your budget and lifestyle! With new Toyota models ranging from low-priced cars to fully-loaded SUVs and pickup trucks, there is a Toyota option for every driver here at Mark McLarty Toyota. Find the ideal new or used Toyota in North Little Rock now! Our intuitive and interactive website helps enhance your car shopping experience, so browse Mark McLarty Toyota online now to trade in your current vehicle, apply for financing and so much more. Why Buy at Mark McLarty Toyota? Here at Mark McLarty Toyota, you will find an extensive selection of the very latest Toyota models available, along with a large pre-owned inventory that includes not only Toyota vehicles but cars, SUVs and trucks from other makes, too. We provide our Legendary Low Prices on every vehicle we stock and are a proud member of McLarty Auto Group, where a commitment to excellence is the norm! When the time comes for Toyota maintenance, see our team of highly qualified technicians that always provide top-tier service in a timely manner. We also give back to our community and participate at local events. The McLarty Drives Education Scholarship Program awards students who demonstrate excellence both in the classroom and in the community. Each dealership in the McLarty Automotive Group awards a scholarship of $2,500 to a selected student. Come check us out soon and see why we're worth the visit! 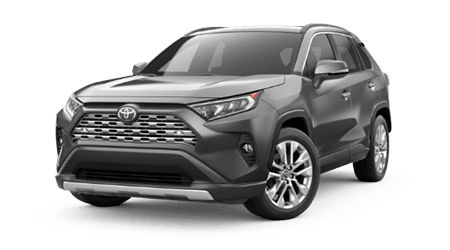 Mark McLarty Toyota is your destination for new Toyota vehicles in North Little Rock, AR, whether you are shopping for a versatile crossover SUV, eco-friendly hybrid or sedan or a powerful new pickup. Visit us from nearby Pine Bluff, Arkansas to fully discover what makes models like the Toyota Highlander and Camry family favorites! 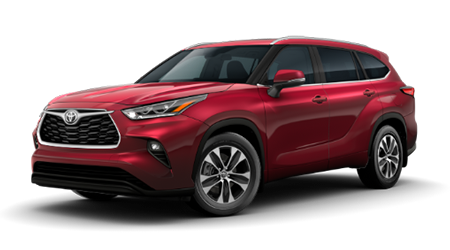 We have made our complete new Toyota inventory available online so that Conway, AR area shoppers can browse new SUVs, pickups and cars for sale with ease. Mark McLarty Toyota is also a used car dealership that is committed to providing local Arkansas drivers with quality pre-owned rides that are competitively-priced and quality-built. Contact our friendly Toyota sales staff about our used cars for sale or the detailed inspection process of our Toyota Certified Pre-Owned (CPO) inventory. Seek out our professional vehicle appraisal services to upgrade to a quality used Toyota Corolla today! North Little Rock, AR car buyers of all credit scores can find the loan assistance they're looking for, with help from Mark McLarty Toyota's finance department. Our new and used Toyota dealership's finance staff will work diligently to locate competitive auto loan rates that are available to you. We also offer financing assistance to drivers in sub-prime credit situations, so do not hesitate to contact us about our stress-free financing process. You can send our team a credit application online now to get pre-approved for Toyota financing! 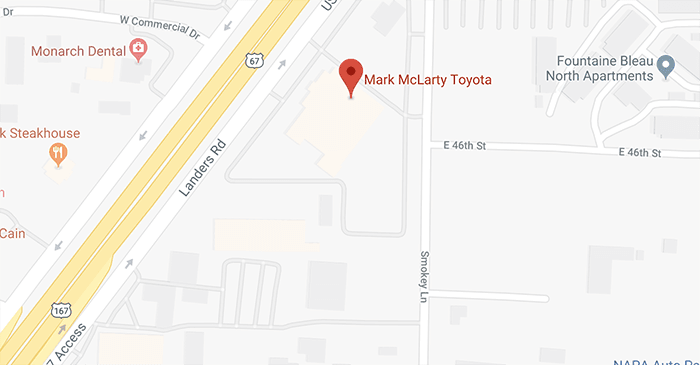 With professional technicians, affordable pricing and a plethora of amenities at our Toyota service center it is no wonder that Pine Bluff, AR area drivers choose Mark McLarty Toyota for any auto maintenance and repair needs. We offer extensive service department hours to help ensure drivers have time to receive quality service for their vehicles. We invite you to fill out our online service scheduler form and request tire service or a brake inspection today. Our Toyota factory-trained are here to keep your RAV4 running smoothly for many miles to come. Help ensure that the replacement parts you are using for any at-home Toyota maintenance or repairs live up to factory specifications by purchasing genuine Toyota parts from our parts department. We carry a vast range of components, and our professional parts staff can help you identify the items you'll need if you're unsure which OEM (Original Equipment Manufacturer) parts you need. View our parts specials online and use our secure parts request form to get the genuine Toyota parts or accessories for your ride; or, visit our parts center for a more personalized parts shopping experience. Enjoy a hassle-free experience that you deserve when you shop and visit Mark McLarty Toyota. Whether you shop us online or visit us in North Little Rock, AR first, you'll be treated to a transparent shopping, financing or service process. At our new and used car dealership you'll be treated to competitive vehicle prices and financing rates, plus a relaxing customer lounge that boasts complimentary coffee and Wi-Fi to enjoy as you shop or service with us. We are committed to excellence in all that we do, so contact Mark McLarty Toyota now to learn more or start shopping online from nearby Conway now!